Movie Review | Make Time For Sports. Marko Zaror as Marcus, the finalist wrestler. Akash Oberoi’s mixed martial arts (MMA) league is in trouble. He needs a fighter who can draw in an Indian audience and fast. His father recommends the name of Sultan—a middle-aged wrestler—living in a small town in Haryana. Akash meets Sultan only for the fighter to reject his offer claiming that he has given up wrestling forever. Oberoi is flummoxed and meets Sultan’s associate Govind to learn what he can do to change Sultan’s mind. Thus begins the flashback into the story of Sultan’s past—his romance with Aarfa Ali Khan, his initiation into the sport in order to impress her (no mean wrestler herself) and her father and how he becomes the supreme wrestler of his time and era. The duo light up the wrestling world earning plaudits at the Asian and Commonwealth Games. Both are scheduled to participate in the 2012 Olympics but Arafa becomes pregnant just before the Games. She stays home while her spouse goes on the represent India at the Games and clinch gold. Sultan becomes egoistic after his many-layered success believing that he cannot be beaten by anyone except himself. He refuses to participate in grassroots level mud akhada tournaments and leaves home once more for the World Championships. He wins gold but is shattered on learning that his new-born son afflicted with anaemia lost the fight for life in his absence. The doctors could not find anyone with his rare blood type (O Rh –ve)—a blood group Sultan shares. Sultan—with his hockey stick—knocks over the head of the statue dedicated to his Olympic triumph. The couple separate. Thus begins the second phase of Sultan’s life—a descent into obscurity and petitioning local politicians to approve the founding of a blood bank in the town. Akash seizes upon Sultan’s requirements and promises him that the cash earned by fighting in his MMA league will deliver his desired dream of a blood bank named after his son. Sultan undergoes strenuous training under Fateh Singh—a blacklisted MMA fighter—and learns the ropes of the new sport. Sultan is thoroughly thrashed by every opponent but defeats them by outlasting them and throwing them over with his classic akhada moves. In typical Bollywood style, the fight scenes and background score tug at the heartstrings and Sultan is reconciled with Arafa when he is critically injured in the semis. Disregarding medical advice, Sultan fights on and emerges victorious in the final round. Sultan visualizes Marcus as his younger, arrogant self depicting the maxim that man’s biggest victory is over himself. Sultan launches a blood bank with his prize money and is reunited with his wife who resumes wrestling. Some years later, they are blessed with a baby girl whom Sultan starts training in the sport. Sultan’s gloves imprinted with the words ‘Venum’. Sometimes you wish Sultan would just stay down after absorbing the kind of punishment he does at his age. MMA is a young man’s sport and the storyline is all pathos with very little logos. Can you imagine that an Olympic Gold wrestler would find it hard to raise funds for a blood bank? State and central governments should be falling over themselves to support any such endeavour. Had Sultan’s return to the ring had been an attempt at redemption, it could have resonated more with the audience. But maybe that’s been overdone and clichéd. Dialogues delivered in earthy Haryanvi seem to be literal translations of inspirational English quotes. The movie is populated with product placements—the most prominent one is Videocon’s D2H placed quite strategically at the back of Sultan’s scooter. While there is no glossing over Arafa’s sacrifice and dismay at learning that she’s on the cusp of motherhood, one felt that Anushka could have portrayed her angst better and that it is perhaps the beginning of the rift between husband and wife. Salman Khan’s scene where he tears off his shirt to self-loathingly view his pot-bellied self in the mirror is perhaps his best attempt at method acting ever. Randeep Hooda as Fateh Singh is impressive. A must see for Salman fans—they don’t need reviews anyway. The movie begins with the Flying Sikh’s heart-breaking loss at the Rome Olympics in the 400 metres. Milkha Singh is far ahead of the field but turns his head to see where his rivals are and loses vital seconds. The result is a fourth place finish; yet, he too breaks the Olympic record along with the medallists. Milkha is haunted by ghosts of his childhood past from Govindpura, in the then Punjab Province, British India—now Muzaffargarh District, Pakistan. Milkha’s parents, a brother and two sisters were slaughtered before his eyes in the violence that ensued following the partition of British India. The film takes off with Milkha’s return to India and his refusal to lead a contingent of Indian athletes to Pakistan to race against Abdul Khaliq—-the fastest man in Asia. Milkha’s back story is narrated by Pavan Malhotra as Hawaldar Gurudev Singh, Milkha’s initial coach, and how he made the journey from a refugee camp to becoming the foremost Indian sportsperson of his generation and arguably of all time. The movie is gripping while depicting life in a refugee camp, Milkha’s initiation into a life of petty crime but meanders in the scenes portraying his first love Biro and his moments with her. To prove himself worthy of Biro, Milkha quits his criminal ways and joins the army. The young Sardar starts running to gain an extra glass of milk, two eggs and to be excused from regular drill. Milkha is soon on his way to becoming one of India’s top athletes and makes the cut for the 1956 Melbourne Olympics. There he meets and falls for Stella, played by Rebecca Breeds, the grand-daughter of his Australian technical coach. Breeds is charming, delightful and lights up the screen with her cameo. The Games, however, are a disaster for Milkha on the field. He loses his race and vows to make good by breaking the existing world record of 45.90 seconds. He trains hard over the next four years with unyielding determination and even rejects a romantic overture from Indian Olympic swimmer Perizaad. Milkha takes the world by storm in the run-up to the Rome Olympics and is one the pre-Games favourites for the 400 metres. Milkha makes the journey across the border for the Friendly Games against Pakistan after being persuaded by Indian Prime Minister Jawaharlal Nehru. The highlight of the movie is his visit back to his village Govindpura where he exorcises demons of the past and is reunited with his boyhood friend Sampreet. The Friendly Games race against Abdul Khaliq is a formality with Singh much too strong and powerful for his opponents. The film ends with an adult Milkha Singh completing a victory lap visualizing his boyish self running alongside him. Overall, an enjoyable movie especially for sports fans and a ‘Don’t miss’ if you’re a follower of Indian athletics. Are you a soccer fan, specifically a Pelé aficionado? Then this film’s for you. There are worse things to do on a sultry, lazy May afternoon other than catching this biopic of the world’s greatest athlete of the 20th century chronicling Pele’s rise from the slums of Sao Paulo to the resurrection of Brazil and their ‘ginga’ style of soccer that makes it the beautiful game it is. Kevin de Paula and Leonardo Lima Carvalho impress in their respective characterisations of the great man as a teenager and as a boy. The scenes of the child Pelé with his friends juggling a home-made football through the by-lanes of their crowded havens are a joy. The action scenes—throughout the movie—delight as the players move to the rhythm of an unheard samba. A historic symbolism is imbued to ‘ginga’ with his Santos scout Waldemar de Brito describing it as a natural peace-time culmination of the Brazilian martial art Capoeira originally practiced by fugitive slaves in Amazonian interiors. Pelé is first noticed by Brito when he and his friends take on all comers in a competition where they are the ‘Shoeless Ones’. They lose in the final to their taunters, an upper-class bunch of snotty kids, who incidentally nickname him Pelé. Dico initially reviles the moniker but accepts it when his father (played by Seu Jorge) informs him it’s the sobriquet that the crowd cheers him on with. Pele’s real name is Edson Arantes do Nascimento—after Thomas Edison— and his familial nickname is ‘Dico’. Dico loses one of his dear friends in a mudslide when they hide from peanut traders whom he and his pals had earlier robbed to pay for soccer boots for the tourney. Pele loses all interest in the game and joins his father João Ramos, better known as ‘Dondinho’, in his janitorial duties. Ramos was a footballer in his younger days but failed to make it big. The crux of the narrative is how Ramos rekindles the flame in his eldest son by teaching him to use firm and soft mangoes while practising balancing tricks using his shoulders, chest and feet. Soon, Pele is back to his ebullient best and it is his mother Dona Celeste who calls in de Brito to sign up Pele for club Santos—aged just 15. Pele, the boy, promises Ramos to bring home the World Cup to Brazil when the national side loses to Uruguay at home in 1950. The nation is heartbroken and the primeval style of ‘ginga’ is discarded in favour of European- styled discipline and rigor. Pele moves to Santos but is disillusioned with the unimaginative style of play imposed by the Santos coach. He almost quits the club but is convinced to stay on by de Brito who believes that he has ‘The Ginga Force’ in him. Once Pele displays his acrobatics and scores a goal for his Youth side, his coach is converted and lets him have his lead. He makes the first side and from there it’s a natural progression to the national side bound for Sweden for the 1958 World Cup. The rest is history, as they say. Nursing a knee injury, Pele is lacklustre in the group games. The 17-year-old announces his arrival on the big stage scoring a hat-trick in the semis against France and a brace in the finals against Sweden. A group of misfits, derided so by Swedish coach George Raynor, gell together marvelously around the Black Pearl to bring home the Jules Rimet trophy. The entire world embraces the ‘ginga’ style and soccer is never the same again. Rating: 2.5 stars out of 5 stars. Cast: Ben Foster as Lance Armstrong, Chris O’Dowd as David Walsh, Guillaume Canet as Michele Ferrari, Jesse Plemons as Floyd Landis, Lee Pace as Bill Stapleton, Denis Menochet as Johan Bruyneel, Dustin Hoffman as Bob Hamman, Edward Hogg as Frankie Andreu,Elaine Cassidy as Betsy Andreu,Laura Donnelly as Emma O’Reilly, Bryan Greenberg, Sam Hoare as Stephen Swart, Kevin Hulsmans as Filippo Simeoni, Alex Croft as Unspecified European Cyclist, Matthew Radford as Unspecified Mountain Bike Rider, Josh O’Connor as Rich, Nathan Wiley as Charles Pelkey. The Program is a film based on journalist David Walsh’s book Seven Deadly Sins: My Pursuit of Lance Armstrong. Walsh of the Sunday Times is convinced that Lance Armstrong’s victories in the Tour De France are fueled by performance-enhancing drugs. The journalist’s reaction on meeting Armstrong for the first time is that he’s good but not great. “He’s good enough to win a day race but not the Tour,” he announces to his fellow journalists but then Armstrong has him eating his words. Armstrong too realises that he’s just not good enough to win the Tour De France on his own. He turns to Italian physician Michele Ferrari for help. Ferrari rejects him initially because he believes that Armstrong is simply not built for racing. Armstrong is struck with testicular cancer but recovers to found the Live Strong foundation to assist other cancer survivors. But the film leaves the viewers with no ambiguity about Armstrong’s villainy when a doctor bursts into his hospital room with the query whether he had ever used performance enhancing drugs while training. Following his recovery, Armstrong seeks out Ferrari again this time convincing him that his body shape has changed since his cancer treatment. Ferrari agrees to work with him starting him on a course of Erythropoietin or EPO. EPO increases the production of red blood cells thus increasing VO2 max in athletes. Armstrong is the leader of the US Postal Team winning the Tour De France seven consecutive times. Armstrong institutes a doping culture within the side that includes Floyd Landis who is seen as the logical successor to Armstrong when he retires. Armstrong considers himself bigger than the sport itself believing himself to be untouchable; he feels that the integrity of cycling would be compromised if his positive test results are disclosed to the world at large. Armstrong manages to appear above it all; challenging his opponents in court and in the court of public opinion claiming that he has never tested positive. He takes Walsh and the Sunday Times to court and wins damages. Armstrong also wins a case against SCA Promotions who attempt to withhold his $5 million bonus. The Texan retires after claiming a record seven Tour De France titles. He is widely considered the greatest ever cyclist. Following his retirement, his former teammate Floyd Landis wins the 2006 Tour De France. He later tested positive for an unusually high ratio of the hormone testosterone to the hormone epitestosterone (T/E ratio). Landis first denied the allegations but later testified to the same accusing Armstrong among others. The Federal investigation leading from his allegations was dropped but a later United States Anti-Doping Agency (USADA) investigation found Armstrong guilty. He was banned for life. With his lies unraveling, Armstrong finally comes clean to Oprah Winfrey on national television. Ben Foster plays Armstrong with a conviction that conveys his single-mindedness in pursuit of cycling’s Holy Grail. He brooks no opposition in pursuit of his goal. He can be both charming and charismatic. He rubs shoulders with the high and mighty and the best of Hollywood. He has no qualms about cheating believing that the sport is riddled with them. Jesse Plemons is Floyd Landis, a conflicted rider who sees Lance as his mentor but is devastated on being left out in the cold when he’s caught. He gives up Armstrong and his former teammates turning whistle-blower. The movie though leaves you cold. Armstrong has no redeeming qualities–even his work for his own foundation Live Strong leaves the audience unmoved. Catch it if you’re interested in the Armstrong saga. But don’t expect fireworks or thrilling sporting action. There is very little to redeem a movie that could well have been a documentary. Cast: Stephan James as Jesse Owens, Jason Sudeikis as Larry Snyder, Shanice Banton as Ruth Solomon-Owens, Jeremy Irons as Avery Brundage, William Hurt as Jeremiah Mahoney, Carice van Houten as Leni Riefenstahl, Amanda Crew as Peggy, Jeremy Ferdman as Marty Glickman, Barnaby Metschurat as Joseph Goebbels, David Kross as Carl “Luz” Long, Glynn Turman as Harry Davis, Jonathan Aris as Arthur Lill, Shamier Anderson as Eulace Peacock, Tony Curran as Lawson Robertson, Nicholas Woodeson as Fred Rubien, Giacomo Gianniotti as Sam Stoller, Eli Goree as Dave Albritton, Anthony Sherwood as Rev. Ernest Hall, Jon McLaren as Trent, Tim McInnerny as General Charles, Vlasta Vrána as St. John, Adrian Zwicker as Adolf Hitler. Race is a movie about Olympic races and racism. Set in the 1930s when segregation existed in the United States, it recounts Jesse Owens’ journey towards becoming arguably the greatest athlete of the 20th century. The biopic begins with young Jesse being accepted to Ohio State University. Coach Larry Snyder’s goal is to ensure his qualification to the 1936 Berlin Olympics. Snyder initially comes across as someone who sees Jesse as an ends to relive his own shattered dreams of Olympic glory. His character warms up helping Jesse with a stipend to send home to his girlfriend Ruth and baby daughter. Snyder advises Jesse when he suffers heartbreak at his dilemma about whether he should continue with his new love interest—city girl Peggy— or try and win back his childhood sweetheart, Ruth. Snyder is the unwitting witness to the continuation of the cleansing policy against Jews instituted by the German dictator when he visits Berlin downtown to pick up shoes made by Adi Dasler, the founder of Adidas. Owens thus becomes the first African-American endorser for a shoe company. Training at the Ohio State University, Jesse learns to stay crouched and bent into an explosive start to reduce wind resistance. This is enforced by the use of hurdles that he would dash into if he were upright too soon into his stride. Jesse and his fellow runners are taught how smaller strides don’t necessarily mean that they’re moving slow as long as their leg turnover is substantially higher than normal. Jesse (actually pronounced Jay Cee) is no paragon of virtue, although a speed demon on the track. He is a young man who succumbs to temptation and bright lights when away from his girlfriend Ruth. He realizes his folly and asks Ruth to marry him which she does. Ruth, however, is no shrinking violet, sending her beau a breach of promise notice on learning of his dalliance with Peggy. Avery Brundage makes the case for American athletes participating at the Berlin Games. His proposition is passed by a narrow margin by the US Olympic Committee. The reigning president of the Amateur Athletic Union, Jeremiah T Mahoney, resigns in protest. His conscience wouldn’t allow him to support American participation in the Games. Jesse is forced to make a choice. Should he run at the Berlin Games and be perceived as supporting Hitler’s policies towards Jews and Negroes or stay home and forgo his chance for glory? There follows a telling scene where Jesse has a showdown with Snyder about the issue. Snyder snaps at Jesse saying that he doesn’t care what the African – Americans have to say about his participation in the Games; both Jesse and he have worked too hard to just throw it away. Jesse responds that he doesn’t have to because African-Americans aren’t his people. Jesse finally decides to take part; his teammate Eulace Peacock who suffers a hamstring pull before the Games convinces him that participating is the best way to prove that Hitler is wrong— no one would remember him as the athlete who walked away. He’d certainly be recalled as the Olympian who won gold at Hitler’s games. On arriving in Berlin, Germany, Jesse and his African-American teammates are surprised that the athletes’ mess and rooms at the Games are not segregated. Owens—wearing a jersey numbered 733—wins the 100 metres quite easily. He is, however, snubbed by Adolf Hitler who leaves the stadium without shaking his hand. Olympic Committee officials had insisted that the Fuhrer personally greet every victor. The dictator chooses instead to wish German athletes only. Jesse wins the broad jump final quite handily. He follows suit in the 200 metres. It’s not entirely a victory for American ideals against Nazi ideology . Jesse’s Jewish teammates, Marty Glickman and Sam Stollerare, are cut from the 4*100 relay, a concession made to Goebbel on behalf of the Fuhrer. Owens returns home a triumphant American hero only to take the service elevator to his own felicitation dinner. An interesting sidelight in the movie is the depiction of Leni Riefenstahl, the German film director, producer, screenwriter, editor, photographer, actress, dancer, and propagandist for the Nazis. Riefenstahl is invited by Joseph Goebbels, Minister of Propaganda, to film the Games. Her film Olympia was highly successful and included shots of all competitors. Reifenstahl—in the movie—ignores Goebbels to film the famous montage of Owens. Carl Lewis would go on to emulate Owens at the 1984 Los Angeles Olympics , a games hit by a retaliatory boycott by the Soviets for the 1980 shunning by the Americans. Owens—-unsuccessfully— tried to convince then President Jimmy Carter against it because he felt that the Olympic ideal was a time-out from war and above politics. Owens remained married to Ruth until his death in 1980 of lung cancer. He was a chain smoker for 35 years. Chess is a game that requires patience and utmost preparation. I have neither; neither the patience nor the inclination to prepare thoroughly for a board game that supposedly teaches strategy. I, however, do have the greatest admiration for chess wizards and their dedication to the sport, the art, and their understanding of its intricacies. I consider it a waste of time to be seated across a board where in most cases you’re just waiting for the other player to commit a glaring error, rather than going all out for victory. When even a silly miscue means that you lose the game is not something that appeals to me specifically when I’m a person who simply hates to lose. I’m disinclined to play any game I’m ill-prepared for. I guess, you could term me a sore loser. ‘Pawn Sacrifice’ directed by Edward Zwick and co-produced by Tobey Maguire is a must-see for chess buffs and for those who’d like to know what life was like at the height of the Cold War. Else, the movie might leave you cold unless you’re a huge fan of Maguire. Tobey Maguire enacts Bobby Fischer with insouciant nonchalance, his hooded eyes betraying his age and which he uses to judicious effect while portraying the brooding protagonist. Liev Schrieber plays the American genius’ acclaimed opponent Boris Spassky in an understated way. That’s understandable given that most of his dialogues are in Russian and he alternates between looking like a gangster with his dark glasses and decidedly bemused at enacting such a sterling role. Peter Sarsgard has by far the most interesting role in the film. He is William Lombardy, a Catholic priest who is Fischer’s second for his acrimonious title match in Reykjavík,Iceland. He defeated Spassky and Fischer when he was much younger but readily admits that they have since left him behind. Having a priest as a second is quite surprising. That reads like a page out of a novel. Truth certainly is stranger than fiction. Lombardy is believed to have coached Fischer since he was 11-and-a-half till the World Championship. The movie begins by Fischer failing to turn up for the second game of the title match handing his opponent a 2-0 lead. The chess world is bewildered at the young eccentric’s chutzpah and his demands that the match be moved to a ping-pong room in the basement. The film then flashbacks to Bobby’s childhood and how he hates losing on the chessboard. Throughout his progression to the title match, Bobby displays immense self-belief in his powers and his destiny to be the best player in the world. 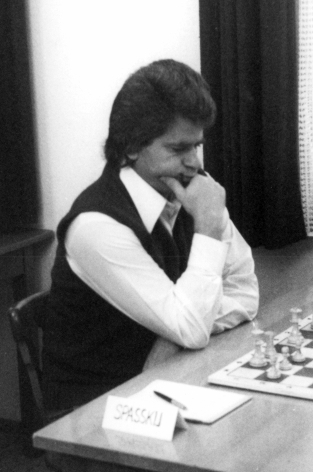 Fischer is aggressive on the chessboard preferring to go for a win than play for a draw—the reason for his losses to Spassky in his initial bouts. Tobey Maguire is intense when seated across the board. His attempts at displaying Fischer’s paranoia and obsessive delusions seem overdone though. It is not convincing enough and is a side-story in the bigger picture which is about a David taking on the Goliaths of the chess world. The story is not just about a battle on the board but a battle of ideas, cultures, and economic systems. Fischer, as played by Maguire, comes across as one-dimensional yet likable. The confidence and arrogance with which he takes on the Soviets and beats them is at odds with his fearful and suspicious nature when closeted in his room checking for bugs and listening devices in his phone. He is also not comfortable with changes be it not having a wooden table for the title match or the sound of whirring cameras. He’s not the only one afflicted so. Spassky has his chair x-rayed and the hall combed only to discover two dead flies in the light bulb fixture. While Fischer’s demands appear extreme, the reasoning can hardly be faulted by Spassky and that is probably the reason he accedes besides not wishing to win by default. Machismo is on display and the clash of egos makes for interesting watching. Fischer is the face of capitalism with his stipulations for more money. The young man is quite aware of his drawing power and wants his share of the pie. Chess transforms into a spectator sport, with the drama followed all over the world. The biopic does not delve into the chess itself but the personality of Bobby Fischer, his state of mind and the run-up to his greatest triumph. It would have helped if the other actor’s characters were etched out as well. Their roles are much too sketchy. Bobby Fischer , to the Russians, with his tantrums is the embodiment of capitalism and the ‘we want it and we want it right now‘ culture of the Western world. The willingness of the Russians to embrace the paraphernalia of the west such as limousines, dark glasses and bask in the sunshine of California beaches underscores the lure of its hedonistic culture and is the reason so many Soviet and east European athletes, diplomats and writers would emigrate when they visited the West. The right to express oneself freely, right to the pursuit of happiness and the right to privacy are not to be factored into the equation, right? The movie skims over the use of psychologists and hypnotists as part of mental warfare waged by chess players and their entourages. It is a mental game where even the slightest disturbance can derail one’s train of thought and a hurried or casual move can end in disaster on the board. Michael Stuhlbarg plays Paul Marshall, the patriotic lawyer who makes the title match happen, hustling and pulling strings behind the scenes. Bobby Fischer’s overriding wish was to become the world champion and then he had nothing else to prove. That could explain why he lost the desire to dominate the board game aside from his psychological problems. Luckily for the west, they soon found a darling in Garry Kasparov, the outspoken and debonair product of the Soviet system. Bobby Fischer ended up a crackpot and a recluse ending his days in Iceland, the site of his ascent to glory. The decadent West made him a vagrant and had him ignore their sanctions when he played Boris Spassky again in trying to relive the glory days. Nostalgia in him was not matched in them. Their disapproving eyes disowned him making him a wanderer from country to country. For the protagonists, the match is less about politics than about proving themselves to be the supreme players of their time. They are seekers of excellence on the chessboard. Spassky’s hotel room scene where he agrees to Fischer’s demands underlines the omniscient eye of the KGB. The Soviet State was a mistrustful regime where one in two persons was an informer to the government. That was the harsh reality of those times. You could not trust your neighbors. Fischer is shown to be a genius who continually learns from his mistakes on the board. Alas, not so with his life. Another scene from the movie where Fischer frequents the Russian embassy bookshop to learn the latest games of his opponents is interesting. The woman proprietor remarks, “You don’t like us Russians but you admire our brilliance.” Or something to that effect. How true. Respect transcends borders. An infuriated Bobby Fischer storming out of the World Chess qualifiers , his ambition of becoming the world’s youngest chess champion thwarted by the gaming of the tourney by USSR players is captured brilliantly. Fischer’s arrogant confidence is matched by his aspiration for fair play. This marks the beginning of his disillusionment with the existing chess set-up, specifically the Soviets. Fischer petulantly states that he’s quitting chess. Lombardy, in conversation with Marshall, is prescient when he warns the lawyer that if Fischer’s fragile mental state is not addressed, he could end up reprising another historic American chess player of the 19th century, Paul Morphy. 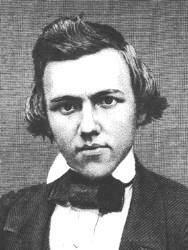 Morphy, a chess prodigy, was the unofficial World Champion of his era. Though he never beat the reigning European champion Howard Staunton, Morphy was considered a superior player. Morphy retired from chess to to begin a law career that never really took off. He was twenty one when he quit. Morphy considered chess to be amateurish and not a serious profession. Chess players , in those days, were considered no more than professional gamblers. Catch the movie if you’re a fan of chess history but don’t expect fireworks. The movie, though not cerebral, works if you’re aware of the back story else you might as well stay at home.